Well, it's understandable. Yet another online photography course? The Internet doesn't suffer the lack of online photography courses, online photography in general, or anything else "online", for that matter. This one is different, though. For once, it doesn't even try to be one. It doesn't give any directions, rather suggestions and recommendations. More often, it's just information, and you are the one to make conclusions and decisions how to use it. Why is that? In my opinion, photography isn't a science. Yes, understanding its basics requires some delving into physics, and yes, there are some useful rules and techniques. But these rules are never imperatives, and these techniques are free to shift and adapt. There's nothing set in stone: as long as you are aware of breaking a rule in order to achieve some goal, as long as you do it knowingly, you are very much welcome to go ahead and try. After all, you are the one in command here. Whenever you decide to take a picture, be in control. Make your camera take the image you have in your head. Remember the story? In 2011, British nature photographer David J Slater made a trip to Indonesia to photograph local fauna. 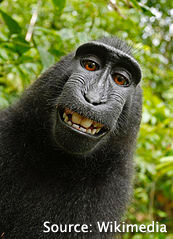 While at that, some macaques got hold of his camera set up on a tripod to take pictures of them and, instead, started taking pictures themselves. While many an image ended up totally blurred or otherwise botched, some of the pictures miraculously turned out just fine, by any standards. These particularly included some striking portraits of both the pranksters and the unlucky camera owner. I don't want to take sides in the ongoing confrontation. While the effort of getting to the location on the part of the photographer is undeniable, so is his participation in the creation of the images questionable, to say the least. There was no intent on his part to create them the way they came into being. He didn't give his camera away on purpose. He definitely didn't direct monkeys to take the photos. In no way did he contribute to the resulting images. His camera did, yes. But is it enough to claim the authorship? I don't know. Why retelling this? It's an exciting story, for sure, but just ask yourself whether your images are rather those of your camera. If you think they are, and if you want to change this, keep reading! History of photography, from the early beginnings to the present day: Part 1 of the series. Understanding camera exposure principles and settings, including exposure compensation, bracketing, and manual exposure. Composition is ultimately what your photography stands or falls with. Even with the exposure nailed down, if your images don't engage the viewer, nobody will bother. Read here what matters in order to succeed. Part 2: The light gets captured. Part 3: The first negative-positive process makes multiple prints possible. Part 4: The best of two worlds. Part 5: The dawn of the film.